When the weather is balmy and a beautiful lakeside sunset beckons, a tasty cocktail you can whip up in a snap is just the thing. For maximum ease, a self-serve bar allows everyone to choose their own combinations and ratios. Set up the basics on a tray and have plenty of ice at the ready. Collins glasses are a great all-purpose shape, and non-breakable glasses are a good idea down at the dock. 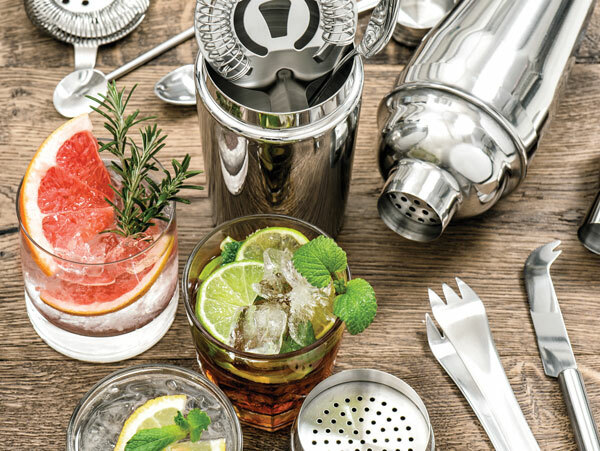 Provide a combination of basic bar liquors (light and dark rum, gin, tequila, bourbon, scotch), simple mixers, and garnishes, and let the party begin. When shopping for mixers, bypass humdrum supermarket brands with high fructose corn syrup and instead choose top quality labels made with real sugar and other natural ingredients. One popular brand is Fever Tree (available at Kroger and Target), which offers a range of different flavored tonics, club soda, ginger ale and ginger beer in individual bottles, so each drink is fizzy fresh. They even have naturally “light” options with reduced sugar—a much better alternative to artificial sweeteners. A true classic, ratios for this cocktail range from 1:1 to 1:3 of gin to tonic. Definitely start with top-shelf options—including a bar staple like Bombay or its more flavorful cousin, Bombay Sapphire. Or, try Hendrick’s—a Scottish import that stands out for its use of Bulgarian rose and cucumber. You can further jazz up this classic combo with infused tonics, or with additional ingredients. You can add a dash of pomegranate juice, muddled cucumber, or sprigs of fresh garden herbs like rosemary and basil. American whiskey sales reached $3.4 billion in 2017, according to the Distilled Spirits Council, so no bar is complete without a good quality bourbon on hand. (Two of the country’s top-sellers include Bulleit and Woodford Reserve.) And while you can mix many fancy cocktails with this favorite brown liquor, sometimes simple is best. Mixing bourbon and ginger ale in a 1:4 or 2:4 ratio creates a basic cocktail you can augment with bitters, citrus peels or wedges, or sweet herbs like mint. Also called a classic highball, you can mix a simple cocktail by adding two ounces of scotch whisky to two-to-four ounces of club soda served over ice. But you can also snazz up this simple drink with a dash of orange or other bitters. Or have orange or grapefruit peels ready to twist and drop in for flavor. When choosing a scotch for this cocktail, you need to aim for good quality brand, but not the highest end. High-end single malts like Glenfiddich and Macallan are intended for sipping— and the price reflects that. Aim for a good quality blended like Chivas Regal or Johnny Walker Red. Fresh mint, muddled with sugar and lime, mixed with rum and club soda makes a classic mojito. Muddle about 10 fresh mint leaves and ½ lime, cut into smaller wedges, with a tablespoon of sugar. Add crushed ice and pour 1 ½ to 2 ounces of white rum. Fill the rest of the glass with club soda. Some great rums to stock for this cocktail include Bacardi and Cruzan Rum. Mixed with some fresh grapefruit juice, lime juice, sugar and club soda, a good tequila creates a tangy, fresh, refreshing cocktail perfect for summer nights. Most recipes will start with ½ cup of fresh grapefruit juice, a tablespoon of lime juice, a teaspoon of sugar, 2 ounces of tequila and about ¼ cup of club soda. 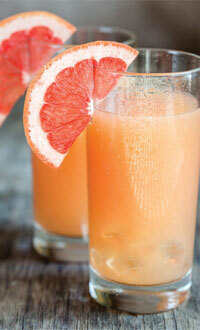 You can also shortcut the recipe by stocking grapefruit soda and mixing it with tequila and lime juice.